ENGINE, DURAMAX 6.6L TURBO-DIESEL V8, B20-DIESEL COMPATIBLE (445 hp [332 kW] @ 2800 rpm, 910 lb-ft of torque [1220 Nm] @ 1600 rpm) Includes (K40) exhaust brake, capped fuel fill and (K05) engine block heater. 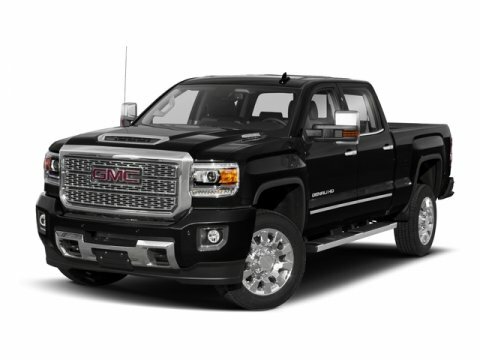 This GMC Sierra 2500HD delivers a Turbocharged Diesel V8 6.6L/403 engine powering this Automatic transmission. WHEELS, 20" (50.8 CM) CHROMED CAST ALUMINUM (STD), WHEEL, 18" X 8" (45.7 CM X 20.3 CM) FULL-SIZE, STEEL SPARE., TRANSMISSION, ALLISON 1000 6-SPEED AUTOMATIC, ELECTRONICALLY CONTROLLED with overdrive, electronic engine grade braking and tow/haul mode. * This GMC Sierra 2500HD Features the Following Options *SUSPENSION PACKAGE, STANDARD includes 51mm twin tube shock absorbers and 33mm front stabilizer bar (STD), DURAMAX PLUS PACKAGE includes (L5P) Duramax 6.6L Turbo-Diesel V8 engine and (VQY) chrome recovery hooks, LPO, (MW7) Allison 1000 6-speed automatic transmission (Includes (DQS) outside memory equipped heated power-adjustable vertical trailering mirrors.) , TIRES, LT265/60R20E ALL-TERRAIN, BLACKWALL (STD), SUNROOF, POWER, SEATS, FRONT FULL-FEATURE LEATHER-APPOINTED BUCKET with (KA1) heated seat cushions and seat backs. Includes 12-way power driver and front passenger seat adjusters, including 4-way power lumbar control, 2-position driver memory, adjustable head restraints,(D07) floor console and storage pockets and (K4C) wireless charging (STD), REAR AXLE, 3.73 RATIO, PAINT, SOLID, ONYX BLACK, MIRRORS, CHROME, OUTSIDE HEATED POWER-ADJUSTABLE VERTICAL TRAILERING, MEMORY-EQUIPPED, UPPER GLASS, POWER-FOLDING AND MANUAL EXTENDING; Includes integrated turn signal indicators, consisting of 51 square inch flat mirror surface positioned over a 24.5 square inch convex mirror surface with a common head and lower convex spotter glass (convex glass is not heated and not power-adjustable) and addition of auxiliary cargo lamp for backing up (helps to see trailer when backing up with a trailer) and amber auxiliary clearance lamp, LPO, CHROME RECOVERY HOOKS. * Stop By Today *A short visit to Bleecker Buick GMC located at 926 E 4Th Ave, Red Springs, NC 28377 can get you a dependable Sierra 2500HD today!